Award winning sailors and filmmakers Ben & Teresa Carey are taking the lead in an exciting new cooperative venture between the sailing and scientific communities. They are partnering with The Ocean Foundation, Dr. Nina Bednarsek and Swift Engineering to create a citizen science project in which oceangoing vessels can collect vital data that will help document the state of the world’s oceans. Their project, called Hello Ocean, launches this summer. Hello Ocean is a project of The Ocean Foundation, a 501c3 non-profit organization, and has two critical parts. It’s a multi-media outreach series with the goal of bringing ocean science into the mainstream conversation. Second, it is a citizen science ocean acidification study in which recreational boaters serve as volunteer citizen scientists. The oceans are the last truly wild frontier on Earth. 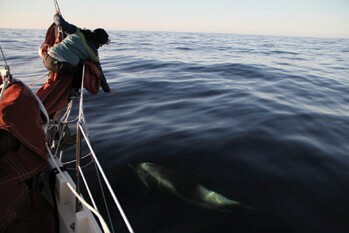 Much of them are unexplored and undocumented. Often, the expense of hiring a research vessel to conduct data collection is too costly to be beneficial. Therefore, scientists are increasingly relying on volunteers to collect data. Citizen science is scientific research that utilizes volunteer, amateur scientists to collect data in the real world. Sailors participate in citizen science studies for a variety of reasons. Many of them find that their vacations or daily lives are enriched by participating in real scientific research that could lead to better protection or management of our natural resources. Teresa & Ben are teaming up with biological oceanographer Dr. Nina Bednarsek to do a baseline study of ocean acidification’s effects on biomass. This fall and winter they are conducting the pilot study where they will test the equipment and methods. Once they refine the study, their goal is to expand this into an opportunity for recreational boaters, who will be provided the technology with which to collect data. These citizen scientists will also be in contact with Teresa & Ben and Dr. Bednarsek via Google Hangouts, blogs, and videos. Teresa & Ben divide their cruising time between providing sail training opportunities aboard Rocinante and creating ocean conservation media. Last winter, while in Panama preparing their boat for crossing the Caribbean Sea, they filmed at an indigenous Kuna village that’s home to one of the largest nesting populations of leatherback sea turtles, a critically endangered species. They also went to Armila, to learn from a local scientist and community leaders about the leatherbacks and the local culture. From Panama, Teresa & Ben sailed to Maine. During that passage they collected seawater samples, which they delivered via sailboat to Dr. Abby Borrows, a research scientist in Stonington, ME. Dr. Borrows is studying the extent of micro-plastic in the ocean. Most of her data collection comes from citizen scientist volunteers like Ben and Teresa. Recent research shows that micro-plastic is present in every ocean and every body of water on the planet. The extent to which it pollutes our oceans and waterways is a growing concern for ocean scientists since plastic can have severe environmental consequences as it carries toxic chemicals and can never break down. 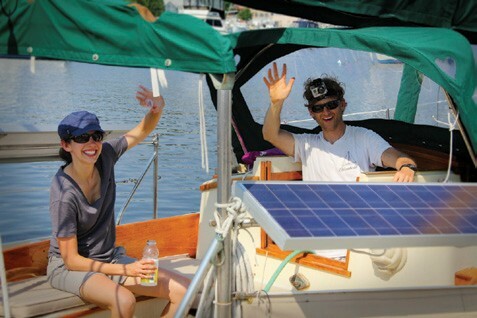 Spreading the word about critical ocean issues is a passion for Teresa & Ben that began with a 2011 voyage where their plan was to sail north until they saw an iceberg. That voyage turned into a feature film called One Simple Question, produced in partnership with Doctrine Creative, a Florida production company. The film premiered at the Blue Ocean Film Festival in November and was released in March for screenings nationwide. Teresa & Ben have launched a crowd-funding campaign to help them jump-start the Hello Ocean project. Sailors and scientists alike, as well as anyone concerned about the future of our oceans, are asked to help support this project. Hello Ocean will notify all interested parties of progress toward the ultimate goal of getting recreational boaters the equipment and instruction they need to take part and make a difference. To make a contribution or find out more about the campaign, visit helloocean.org. For more information about One Simple Question including how you can host a screening, visit simplequestionmovie.com. * Contrary to what you might think, the namesake of Teresa & Ben’s boat is not the protagonist’s horse in Cervantes’ Don Quixote. Rocinante is also the name of a spaceship in the “Cygnus X-1” song cycle by one of Ben’s favorite bands, Rush. To learn more, visit Teresa’s excellent blog, Sailing Simplicity & The Pursuit of Happiness, at sailingsimplicity.com. For more information about Teresa & Ben’s Morse Alpha expedition-style sailing school, visit morsealpha.com. New Business: Local Sailor Aims to Shoot your Boat!